If you love London, you’ll adore this online slot. Love from London is an homage to one of the greatest cities on the planet. Our friends at Random Logic have gone all out to produce a beautiful action-packed slot that captures the true spirit and glory of London. It is no wonder that people flock from all around the world to visit the great City of London. Whether you’re a tourist or a local, there is so much to discover and enjoy. As well as Big Ben and Buckingham Palace, London is also home the best museums, theatres, parks, department stores and anything your heart desires! Love from London Slot celebrates this amazing city by providing you with a stunning 3D animated backdrop (accompanied by a quintessentially British soundtrack). It also shows the city’s romantic side with the silhouette of loved-up couple on a weekend getaway. You’ll spot all the top landmarks, including the London Eye, Piccadilly Circus, St Paul’s, the Shard and Houses of Parliament. Of course, there are some Double Decker buses and Black Cabbies to be found too! This game isn’t just about looks though. It’s a leading-edge video Slot, containing all the latest technological bells n whistles. PLUS, there are jackpots which can reach as high as £100,000!! • Jackpots can reach as high as £100,000! 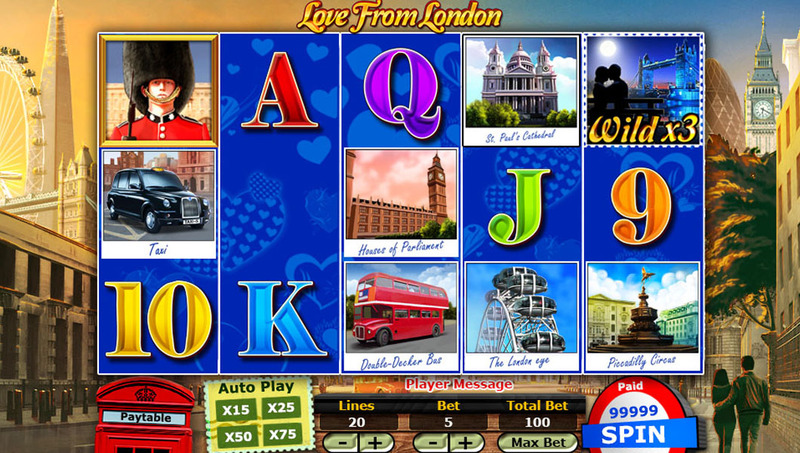 Like the great City itself, Love from London slot has no shortage fabulous features. Get ready to enjoy 5 reels and 20 pay lines filled with London Love. Wagers range from just 1p all the way up to £10, catering to every budget. All Love from London wins are multiplied by the pay line bet, apart from the scatter that multiplies the total bet. Speaking of bets, the ‘Max Bet’ feature lets you up your game by wagering the largest amount possible. You’ll also find handy buttons that let you adjust your Bets and Lines. Love from London has a unique Auto Play feature with 4 different settings. Choose from x10, x25, x50 or x75 spins. If you click on the red phone box you’ll get to the pay table, which contains plenty of useful info, including how much each symbol is worth. The main symbols in Love from London are a Black Cab, a Red Bus, the London Eye, the Houses of Parliament, Piccadilly Circus and St Paul’s Cathedral. The letters are your lower value symbols. There’s also a WILD, which is a lovely image of a couple kissing on Tower Bridge. Plus, you’ll find a SCATTER which comes in the form of a Beefeater. Love from London is all about Free Spins. 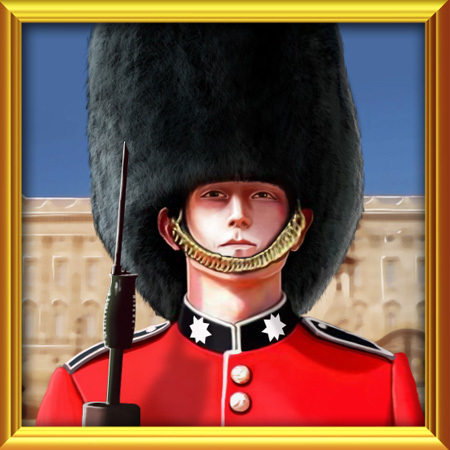 To trigger the Free Spins bonus game, you need to land on 3 or more Beefeater guards (watch out for the fluffy hats). No need to worry about lining them up, they can be anywhere on the reels. You’ll get a whopping FIFTEEN Free Spins, and any wins that you get during the bonus game will receive a 3X multiplier! On top of that, if you land on the Scatter symbol during the bonus round, you can get up to 180 additional Free Spins – It’s Spin-tabulous! • Love from London loves Free Spins! • Additional Bonus – UP TO 180 FREE SPINS! This game is perfect for Lovers of London, and with its romantic angle, it’s nice to play on Valentine’s Day too. Enjoy the city, no matter where you are… Whether you’re on your desktop or mobile device, you can soak up the sites of London, whilst playing a pucka game of slots. Like London itself, there’s plenty of action and you might even win some serious £££’s. What’s not to love?